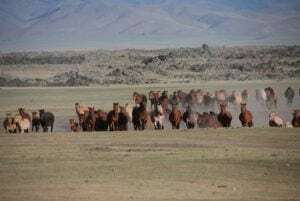 Click on image for a large slideshow. Note: Our prices are in U.S. Dollars (USD$). 2020 prices to be confirmed January 1, 2020. No riding. 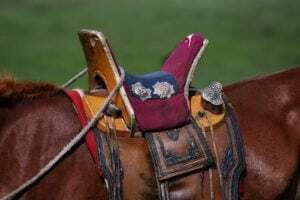 In 2008, a gigantic statue of Genghis Khan riding on horseback was erected on the bank of the Tuul River at Tsonjin Boldog, 54 kms east of the Mongolian capital Ulaanbaatar, where according to legend, he found a golden whip. 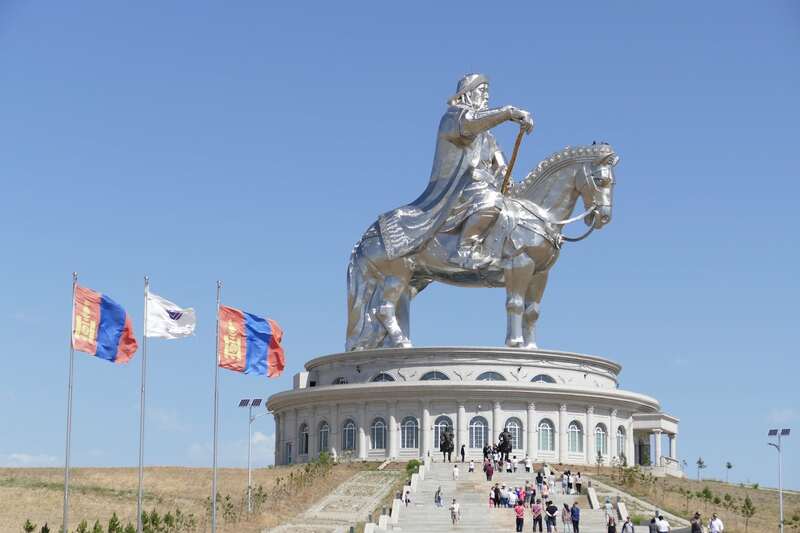 The statue is 40 meters tall and wrapped in 250 tons of gleaming stainless steel. It stands on top of the Genghis Khan Statue Complex, a visitor center that itself is 10 meters tall, with 36 columns representing the 36 khans from Genghis to Ligdan Khan. The statue is symbolically pointed east towards his birthplace. 237km We will start our Mongolian riding experience by heading south about 100km on tarmac towards Gobi desert to get used to the bikes after which hit the dirt track and continue west for 150 km to our ger camp for the night. Baga Gazriin Chuluu is a picturesque mountain in the Gobi desert. 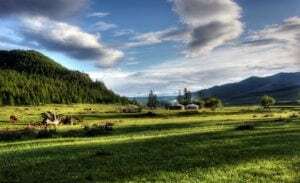 With at an elevation of 1751 metres, it is located in the granite belt and hosts ibex, Siberian argali, vultures, hawks and eagles. 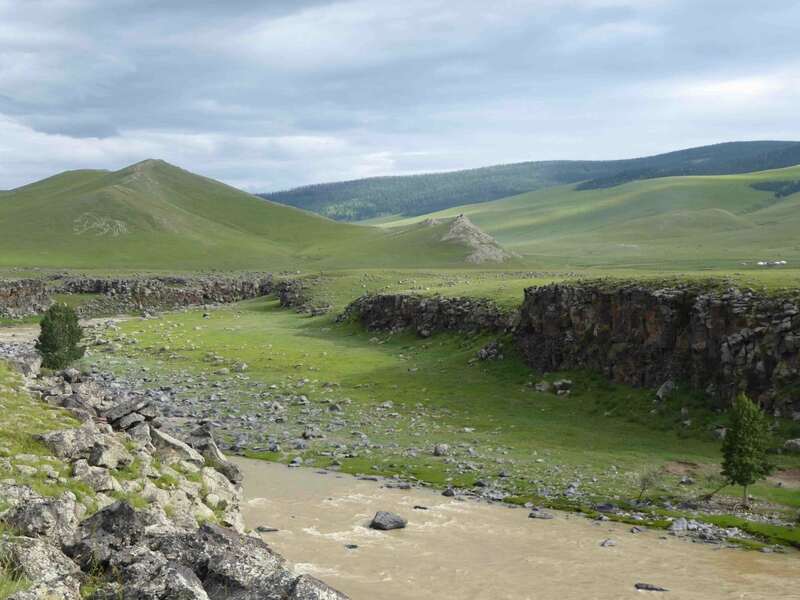 The Gurvan Saikhan mountains are the first sizeable mountains we get to play in. 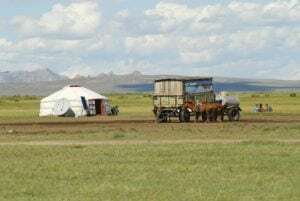 The entire route is dirt will see the gradual change of landscape from steppe to mountain range then large mountains of sand dunes. 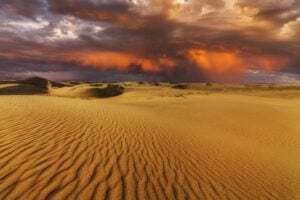 Khongorin els is one of the largest formation of sand which is also known as the \”singing sands\” because of the sound the northwest howling winds cause when passing over the tips of the dunes. No riding. Rest day. 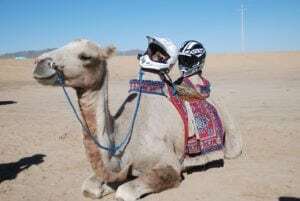 Free day dune climbing with the bikes, camel riding, or relaxing. 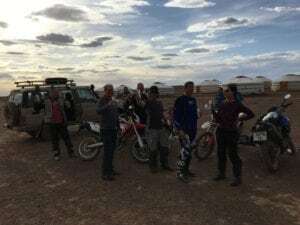 Early start ride from Khongoriin els towards Bayanzag this time we will be riding on the Northern side of Gobi Gurvan Saikhan National park. 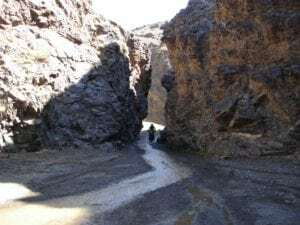 The place also renowned by it’s paleontological findings where Roy Andrew Chapman discovered dozens of paleontological findings in the 1920’s. The red gravel high cliffs and the emptiness make it well worth the visit. 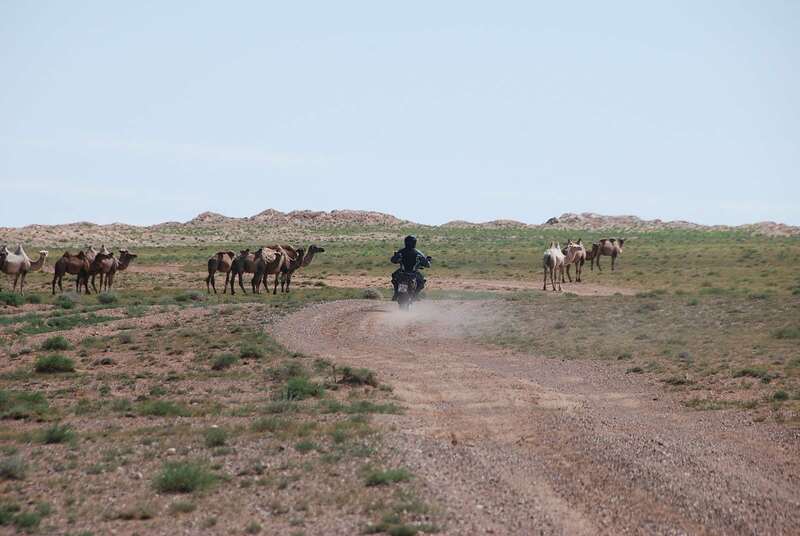 A flat ride from Bayanzag to Saikhan ovoo will bring us beside many Bactrian camels as this area is famous of herding camels. Our stop for tonight will be near Ongi Monastery, formerly one of the largest monasteries in Mongolia established in the mid 16th century. 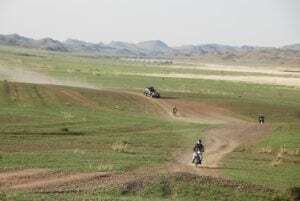 Today will be a long day with an early start to get us to Arvaikher, the provincial capital of Uvurkhangai to refuel resupply and hit dirt tracks to Orkhon valley now you will notice a gradual landscape change to small river crossings, alpine trees, and mountain passes. The heat will be left in the Gobi and the chills of the altitude will be apparent in the evenings. 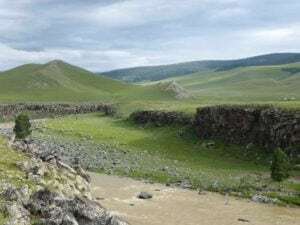 Depending on the water level of the local rivers we will explore the Orkon valley first before we head to Orkhon waterfall, one of largest waterfalls in Mongolia. We also have the option to take a trickier route up to a hidden monastery instead, as weather permits. 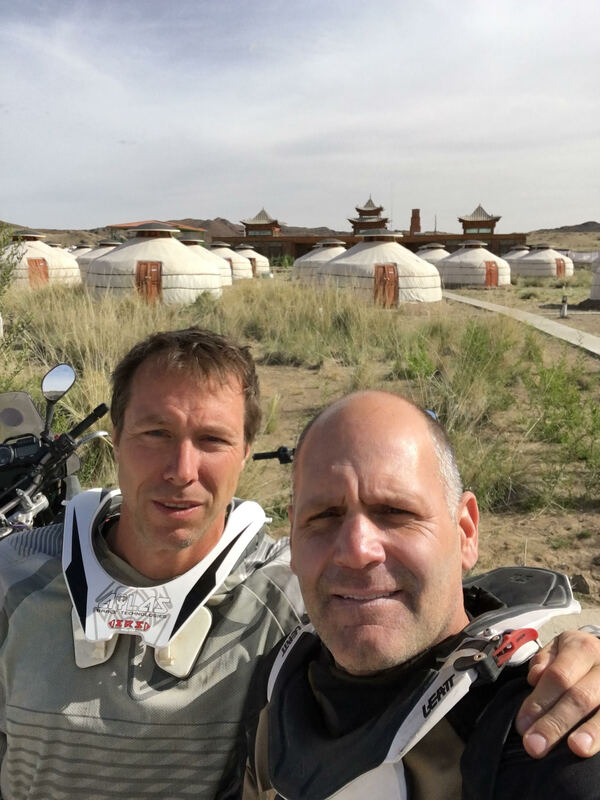 After lunch we will hit the dirt track to Tsenkher hot springs – a delightful ride through hilly mountainous roads, and many little river crossings. Rest day. 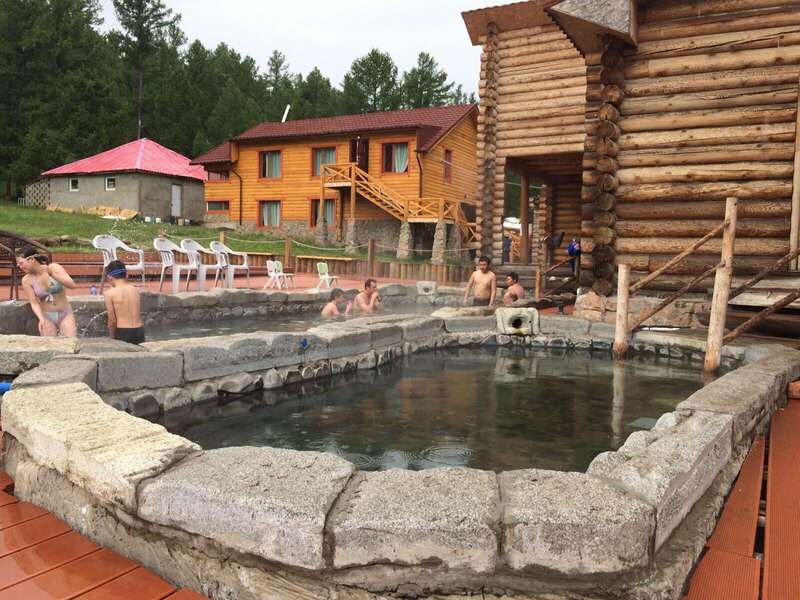 Rest day to recover, soak in the hot springs, fix bikes, laundry, and explore the area on local horses if you wish. We leave the hot springs and head to the ancient capital city of Khar khorin, an ancient capital city of Khubilai Khan a grandson of Genghis Khan. 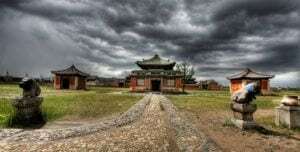 The main attraction is Erdene Zuu monastery which was one of the largest monasteries in Mongolia before it was been destroyed by Communist to repress religion. Today the monastery is active and holds around 100 monks. We have time to visit the new Erdene zuu museum which holds a unique artifacts of Hubilai Khan era. The afternoon brings us to our last set of sand dunes, beautifully set against of river and mountains. 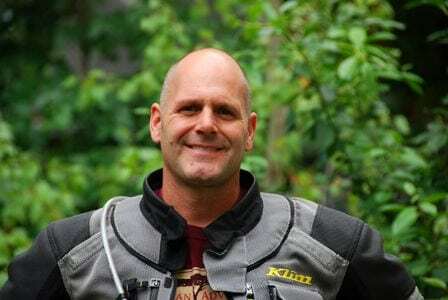 Today will be our longest day of riding on a paved road, and for some it will be a source of great joy after long days on a dirt tracks. 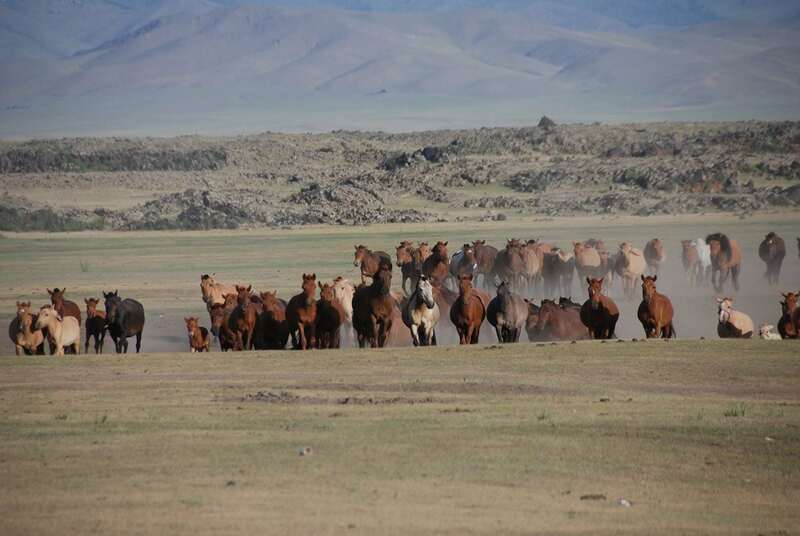 Will start riding towards Hustai National park where Prizewalski wild horses were introduced in the park after near extinction in late 1950’s. 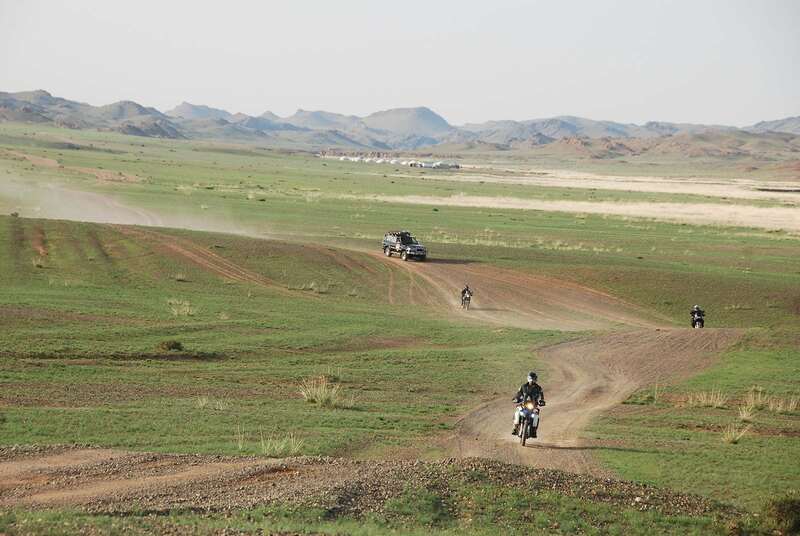 Short ride from Hustai to Ulaanbaatar with option of taking a paved road or dirt track depending how the riders feel. The track is beautiful and follows a valley right up to the city. 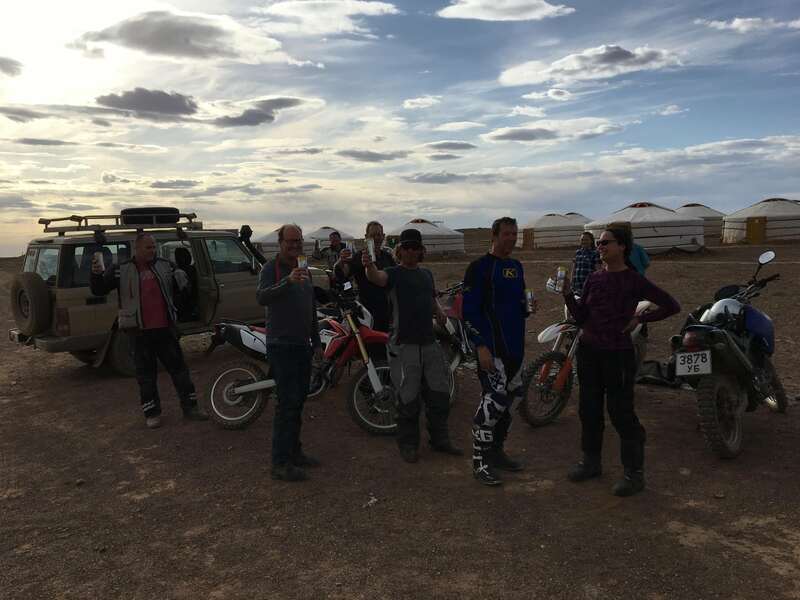 We will return the bikes in the afternoon, and get cleaned up for our last group dinner. After breakfast your driver will take you to the airport, bringing your Mongolia experience to a close.